An effective Access Control System can form an integral part of an effective security system. At Hi-Tech Training our course is designed to give participants a practical knowledge of the operation and installation of Access Control Systems at a foundation level. Our experience has taught us that in order to gain the required skills a large percentage this Access Control Training course dedicated to building, setting-up, testing and trouble-shooting faults using core elements of modern Access Control Systems. At the end of the course an interested and hardworking participant will have a good solid foundation knowledge of what access control is all about. Hi-Tech Training Access Control Course runs over 3 days next course commencing on Sat 8th June 2019. View our schedule for course dates and visit our fees and booking page for registration. This practically based Access Control course is designed to give participants a practical knowledge of the operation and installation of Access Control Systems at a foundation level. Each module of the training program is backed-up by practical exercises, demonstrations and course materials. These training methods give the participant a greater grasp of the practical aspects of the industry and provides them with the “Hands-On” experience and confidence which are so essential for success. Understand the fundamental elements that make up an Access Control System. Fit the principal components of a stand-alone system and networked systems. Connect and programme a card, keypad and proximity stand alone system. Effectively connect up, test and fault-find system elements. Be aware of the issues associated with Access Control Systems. Access Control Systems: – Introduction, principles, uses and applications. Elements of basic and advanced, insecure and secure Access systems. Stages of Access Control: – Identification, Decision, Action. Control Components: – Reader, Keypad, Receiver, Lock. Terms: – magnetic strip, proximity, biometrics, card-free access, readers and tokens. Potential weakness and vulnerability of poor system design. Standalone, Networked and Computer based systems. Locks: – Mechanical and electromechanical, mortise and rim release units. Use of timers and timed zones within access control systems. Storing information gathered by an access control system. Cables: – Types, uses, and applications, Power Supply Units. Fault-finding techniques. Relevant standards and issues, Changing technology and keeping updated. On completion of the Access Control Course, having been successful in TWO examinations (one written, one practical) the participant will receive a Hi-Tech Training Certificate. 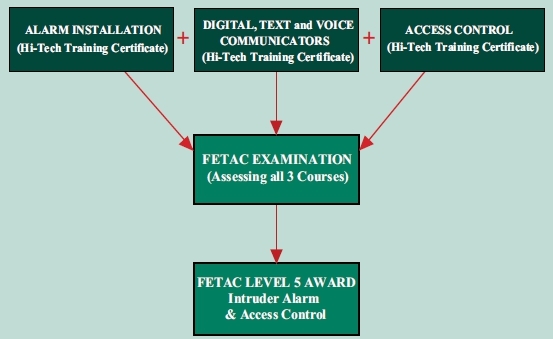 Please note: – Access Control course participants who have attended the Hi-Tech Training courses in Alarm Installation and Digital, Text & Voice Communicators may sit the FETAC/QQI written examination leading to FETAC/QQI – Level 5 Component Award – Intruder Alarm & Access Control (5N1776) on the last training session of this course.